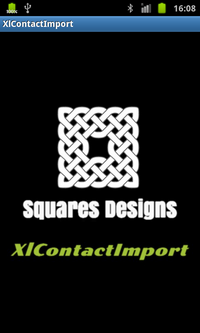 Please make sure you have understood how the XlContactExport / XlContactImport file format of an .xls import file (or an .xlsx file, on the pro versions of the apps) works before doing your first import. A badly formatted import file could probably do some damages to your current contact databases, so please read the dedicated appendix first, and even test the import with this sample test file. if option 1 is choosed, the import will behave in a "replace all" mode, that's to say all contacts datas on the phone will be deleted first, to be replaced, after, by the new contacts data contained in the Excel import file. This option is really useful if you want to start from scratch, or if you sell or buy a second-hand Android phone where you want to wipe all data before insert new contacts. Beware and please use this option carefully, even if this option is secured first with a start button, and then a confirmation dialog box ! Please note that all contacts recorded will be deleted in the process, even on the SIM card and on the phone device itself. 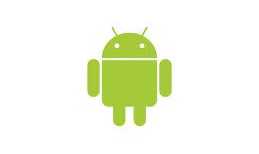 if option 2 is choosed, the import will behave in a "append" mode. That’s the default option and the safest mode to use if you start. The goal is to refresh the data on the contact database using the Excel import file. (1) is the import option selector. Two options are available. (2) is the area where information about the Excel import file appear (.xls, or .xlsx alternately on XlContactExport Pro). 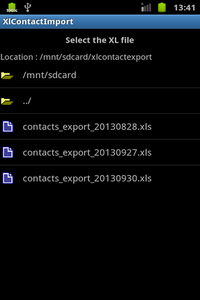 (3)	is the button to start the import of contact datas from a file. (4) is an ad banner. This ap is free, so please help us by clicking this banner, or buy XlContactImport Pro which doesn't have ad banners. Please keep in mind the numbers above, as they will be mentioned in the next section of this tutorial. By default, XlContactImport try to find an Excel file on your SD card, hoping it will be the right one (after all, excel files aren’t that common on Android !). This file path and name is given to you in the (2) area. Please note that the standard version of XlContactImport can read only files using the classic Excel format (.xls / Excel 97 – 2003), so keep the ".xls" extension in the file name if you copy one on your SD card. On XlcontactExport Pro, you can also specify a file with the default Excel 2007 workbook format extension (.xlsx) for the file by typing it instead of .xls in the file name. edit manually the path and the Excel file name in the edit zone. Please take care to enter valid a path and file name, otherwise the import process will fail. You can navigate the directory structure by tapping inside, then select an existing file by tapping it. In the main screen, the file path and name to use will be modified accordingly. All information about the FTP account must be provided in this screen : ftp address, ftp account user name, ftp account password, and the name of the Excel import file. Please make sure all the FTP informatios are correct before using this option, and that the FTP account offers read credentials, otherwise an error message will pop up in the process. If this option is choosed, the Excel import file will be first downloaded on the SD card in a temporary directory, before used for import. The temporary elements will be removed in the process. All information about where to find the Excel import file on the Dropbox account must be provided in this screen : the Dropbox application folder containing the file first, and then the filename of the Excel import file itself. 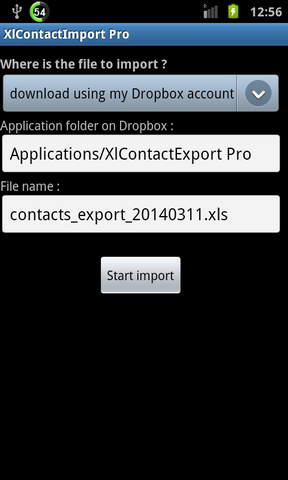 As the XlContactExport Pro app is a natural source of Excel contact file that can be imported, the corresponding application folder name is provided by default in the screen. 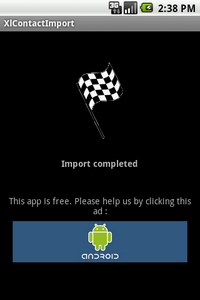 For your convenience, please make sure you have installed the Dropbox app on your smartphone before using this option. If this option is choosed, the Excel import file will be first downloaded on the SD card in a temporary directory, before being used for the import. You will have to confirm the action and give your Dropbox account credentials, which will be kept for a future download. Please make sure all the Dropbox information are correct before using this option, and that the file is located indeed in the designated application folder, otherwise an error message will pop up in the process. If this option is choosed, the Excel import file will be first downloaded on the SD card, before used for import. You can now push the star button ! When the import is in progress, this progress dialog screen will appear. Please note that the progress counter doesn't reflect the number of contacts to import, but the total number of operations that must be done. If a delete operation has been asked first before the import, the progress counter will maybe stop for a few seconds before starting again. If there is an error in the process, an error message will appear in the screen. In this case, the import will be left where the error happened. Otherwise, the import now finished, you can look at the modifications done in your contact database. In case of error, check if your import file is readable and correctly formatted (see this dedicated appendix here). Choose the option, which will activate the trace mode (choose the option again to cancel and desactivate the trace mode). Proceed again with the import. At the end of the process, a file called "trace.txt" will be created on your sd card root directory (in a subdirectory called "xlcontactimport"). Send me the content of this file (with explanations about the encountered behaviour, please) using the form contact here.